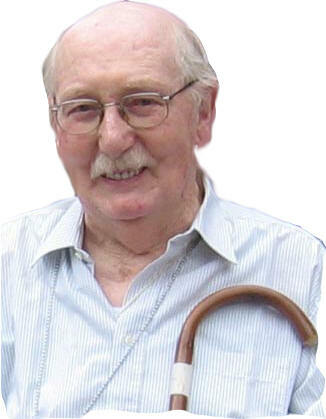 Geoff Dawes, author of several books about Crich, died in September 2007. He was a long time active resident of Crich and Fritchley before he moved to Stone in 1997. What follows is a tribute to him written by his sons Steve, Nick and Peter. Whilst in the 6th form he achieved a County Major scholarship to study physics at Nottingham University, gaining an honours degree. By coincidence Lorna got a job nearby in the telephone exchange. By this time war was brewing and after graduation in 1940, just before Dunkirk, he was recruited by the Navy to help with research into the German magnetic mine threat. Geoff and Lorna got married in Crich in 1942 and set out for a new life in Helensburgh, where he continued work on magnetic and sonic mines and latterly guided torpedoes. In 1946 after the war was over, he moved to Sheffield to the Safety in Mines Research Establishment working on preventing coal dust explosions in deep mines. He was awarded his PhD at London University in 1953 for his research becoming one of the world’s leading experts in dust control and underground explosions. His sons Steve, Nick and Peter were born in 1943, 1948 and 1953 – an exact five year gap between them; this was due to Geoff’s scientific approach to maximising the tax breaks available at the time to fund their University education in later years! Geoff lived in “Upper Roskeen” in Crich and was actively involved in village activities. He wrote and performed in many concerts raising money for the church restoration fund. He helped run salvage drives in his garage yard to raise money for the new scout hut – then spent weeks and weeks painting the hut windows to ensure that they did not rust. He was always hard working but meticulous in organising these activities. However, no matter how much work he had on he always enjoyed his pint of Mansfield Bitter at the Kings Arms on a Sunday lunchtime. In 1969 the family moved from Crich to Fritchley, Geoff personally transformed “Rose Cottage” into a lovely family home with his usual precision and hard work, attention to detail and finite planning. He was a plantsman, each bulb, plant, shrub or tree the right place. Once the roses had rose blight. He made his own wheel barrow, small enough to take through the back porch. He exchanged all the soil from the front of the house with the back. Once more roses bloomed. Whilst living at Fritchley he became Chairman and then President of the OAP Friendship Club helping organise trips and speakers. He was also a keen bell ringer at St Mary’s along with his brother Peter. Geoff was very aware that Society was changing, so he took it upon himself to interview older generations and capture some the passing culture of Crich. Ably abetted by many, and particularly his brother Peter, he wrote and published two small books full of stories and anecdotes - Crich Tales in 1983 and More Crich Tales in 2004. Although in Derbyshire dialect they are ageless in humour and humanity. He also carefully researched the origins of Crich and in 2003 published a history of the area called A History of Crich.